Going to the beach is one of the best ways to relax and have fun in hot weather. But taking a trip to the beach involves a lot of baggage, especially if you’re going with your family and friends. The good news is that a beach wagon can help you transport all your belongings from your car to the beach without making a lot of trips. To help narrow your search, we’ve come up with our list of the 15 best beach wagons available on the market. If you’re searching for a durable beach wagon, this product from MAC Sports is one of the best choices. This wagon is made with high-quality materials from its wheels to its frame. It has rubber wheels with extra tread that allows them to effortlessly roll across any kind of terrain, including sand and gravel. With a weight capacity of 150 pounds, this wagon has the ability to carry all your belongings in one trip. The wagon’s frame is also designed to be lightweight and foldable. This is due to the sturdy hinges that enable the cart to be folded. This multipurpose wagon also comes with a carrying case that helps protect the folded wagon when you’re not using it. Lastly, the telescoping handle of this cart is adjustable. This feature helps prevent back strain, especially for taller people. This beach cart by BeachMall is a great addition to your summer outings. It provides several features that will enable you to carry your things with ease, especially when you’re at the beach. This product has large and thick wheels that can effortlessly roll through the sand. It is also made with spun polyester fabric that can hold up to 75 pounds of your gear. An added bonus is that you can convert this cart into a table to lay out your lunch, drinks, or suntan lotion. It also comes with four holes that serve as a cup holder. Aside from those features, this cart can also withstand long exposure to the sun and salt water, thanks to its frame, which is made with powder-coated steel tubing. In addition, you can store or bring this wagon anywhere easily because of its collapsible design. You can also remove and reinstall the wheels in just a few seconds if you want to make sure it doesn’t roll away. Lastly, this cart’s height is tall enough to make it so that you don’t have to bend over when steering this cart. The Sandusky Lee FCW5424 will definitely catch your eyes with its fashionable design. Aside from its stylish look, though, this product is also a heavy-duty wagon that can carry as much as 200 pounds. This is thanks to its strong orange-colored frame made with iron. The cart’s pneumatic wheels can also turn. That way, you can easily maneuver this wagon even when you’re on sand or any other kind of terrain. Aside from being an efficient beach wagon, this product can also be used to haul your kids. In fact, your kids can sit comfortably inside the wagon on its padded fabric. Lastly, the iron frame of this wagon can also be folded. So, when you’re not using this cart, you can simply store it inside its protective cover. It’s the perfect model for families with young children. This collapsible wagon by MAC Sports is one of the most popular products on this list. This is not only because of its affordable price but because this product is also made of high-quality materials, including its heavy-duty steel frame and 600D fabric. Aside from being durable, this product is also efficient. With a measurement of 35 x 20 x 23 inches, this wagon can carry as much as 150 pounds. So, you can put a lot of things on this wagon. Plus, you can drive it through sand easily, thanks to its four rubber wheels. It also has an adjustable handle so that you can maneuver it easily. Even though this wagon has a high weight capacity, you can fold it down to 8 inches thick for easy transport. This product also comes with a protective case to help shield the wagon when you’re not using it. Another noteworthy feature of this cart is its two mesh cup holders that can carry your drinks while you pull the wagon. An added bonus is that you can use this product in other outdoor activities, like camping and gardening. This multipurpose beach cart made by Sailmaker is not only long-lasting but will also allow you to haul your gear with ease. This is due to the numerous features of this product. For one, it has a four-wheel design with wide rear wheels that enables the cart to navigate through sand, gravel, and other kinds of terrain. With a weight capacity of 125 pounds, this beach wagon can certainly transport all your things in a single trip. Plus, it also has a large mesh compartment to hold your bigger items. Moreover, this cart also has enough space for up to four beach chairs. It also has an umbrella holder and a detachable insulated cargo bag for your cold drinks and snacks. Aside from all those features, this multipurpose cart is also durable enough to be used at the ocean. This is due to the product’s steel frame, which has a rust-resistant coating. Finally, this cart is foldable, and the wheels are removable, so you can easily store it. If you’re looking for a beach wagon that has a high weight capacity, the Sekey Folding Wagon is a good choice. This cart is made with double-layered Oxford fabric braced by a heavy-duty steel frame, which allows the cart to carry as much as 265 pounds. In addition, this wagon also has rubber wheels with tread that is built to drive across the sand and other kinds of rough ground with ease. So, you can easily carry all your belongings in a single trip with this beach wagon. An added bonus is that this wagon has two mesh cup holders that will hold your drinks while you transport your things. Aside from those features, you can also set-up this wagon in a matter of seconds. Plus, you can just fold it down when you’re not using it. Along with being a beach wagon, you can also use this cart in various outdoor activities, such as when you’re camping, gardening, fishing, or carrying your groceries inside. Designed to be the best summer accessory, the Deluxe Ultra Wonder Wheeler can provide a lot of great features. First, this wagon has an insulated cooler bag that can keep your drinks cold as you relax at the beach. It also has a large mesh compartment to carry your towels, a storage pouch for your cellphone and tablets, a holder for your umbrella, and built-in cup holders for your drinks. Although this beach cart has a weight capacity of 100 pounds, you can steer this cart easily, thanks to its 10-inch pneumatic tires that can drive through gravel, sand, or any other rough terrain. So, this cart is not only useful when you’re going to the beach. You can also use it when you’re having picnics at the park or for any kind of outdoor event. Lastly, this durable cart is collapsible, so you can easily store it between uses. The Beau Jardin Folding Push Wagon is one of the few products on this list that has a weight capacity of more than 150 pounds. In fact, this high-quality product can carry up to 300 pounds of luggage. This wagon also has thick rubber wheels that can drive through different kinds of terrain, including sandy beaches. Plus, it has a push handle and a pull handle, which is a great feature when you’re hauling things at the beach. The best part is that the telescoping handle is adjustable. This will not only help prevent back strain but improves the wagons maneuverability as well. Aside from being a heavy-duty beach wagon, you can also use this product for various outdoor activities. And because this wagon has a collapsible design, you can simply fold it when you’re not using it. It also comes with a carrying bag to help protect the product when not in use. This wagon made by Creative Outdoor Distributor is the perfect choice for those who live in hot climates. One reason is that this product comes with a built-in shade canopy that can protect your belongings from the sun. It can also carry a lot of items. This is thanks to its steel frame and 600D blend fabric, which can support a load of 150 pounds. Aside from that, this wagon has four all-terrain rubber wheels that can rotate for increased maneuverability. Furthermore, there are small pockets on the front and side of the box, which you can use for storing snacks and drinks. Lastly, this wagon is collapsible. As such, you can simply fold it up when you’re not using it. The Tommy Bahama All Terrain Beach Cart may seem small, but it is actually a heavy-duty cart that has a weight capacity of 100 pounds. In fact, this cart has 15 cubic feet of storage where you can place a surfboard, four beach chairs, a 48-quart cooler, and your other beach gear. Plus, this cart has its own place for your umbrella. The best part is that maneuvering this cart through the sand is quite easy, thanks to its 10-inch wheels at the back and the dual steer wheels in the front. This beach cart is also made with high-quality materials. It has a steel frame with a powder-coating that shields it from the sun and salt water. Moreover, it also has a water-resistant mesh fabric to keep your things dry. Plus, this product also comes with an insulated cargo bag where you can stock your food and drinks. When not in use, you can simply fold this cart into a thick bag and store it for next time. The Deluxe Wonder Wheeler Wide is a well-designed cart that is perfect for your beach outings. In fact, this product has an X-shaped frame with large handles on its side, giving you enough space to hang everything you need, including four beach chairs. This cart also has a large mesh pocket with 15 cubic feet of storage capacity and a weight capacity of 100 pounds, so it can carry anything you need. It also has a rear storage pocket for your smaller items. Maneuvering this cart across the sand is also easy, thanks to its all-terrain 10-inch wheels at the back and 4.5-inch wheels at the front. This wagon also has a rear handle with neoprene grip. This feature allows you to push the cart with ease even when your hands are wet and sandy. Other notable features include a removable tote bag with a shoulder strap, a side-mounted umbrella holder, and a bodyboard holder. This wagon is another product made by MAC Sports. Like the other MAC Sports wagons we reviewed, this product is made with a sturdy steel frame and 600D polyester fabric giving it the capacity to carry as much as 150 pounds. 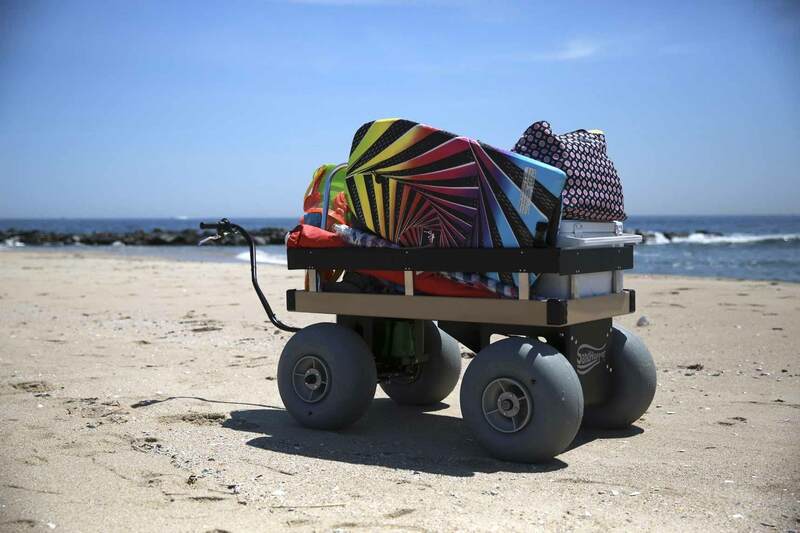 Thanks to its giant beach wheels, maneuvering this cart through the sand is also easy. So, you can haul all your stuff at the beach with ease. A unique feature of this product is its side table with built-in cup holders for your drinks. This wagon also has a collapsible design wherein the front wheels can be tucked between the back wheels, giving the wagon a slim structure that takes up minimum space. Plus, this wagon comes with a carrying case that will help protect it when not in use. If you’re looking for a beach wagon that is durable and easy to maneuver, the Timber Ridge Folding Camping Wagon should be one of your top choices. First, this wagon is made with 600D polyester fabric and supported by a sturdy steel frame. With a dimension of 35.5″L x 18.4″W x 12″H, this cart can also haul up to 150 pounds on a hard surface and 110 pounds on the sand. Aside from its high weight capacity, steering this wagon on sandy beaches is also easy, thanks to its treaded tires that can drive through loose sand. It also has a telescoping handle that allows you to maneuver the cart on different terrain. The best part is that you don’t need to assemble this product. All you need to do is unfold the wagon, and it’s ready to go. This Heavy-Duty Beach Cart by Wheelez doesn’t look like your typical cart but more like a wheelbarrow. Despite that, this product is one of the best beach wagons you can purchase. One reason is its high weight capacity of 220 pounds. But, that’s not all. This wagon also has two oversized balloon tires that can easily drive across loose sand. So, if you normally pack a lot when going to the beach, this cart is the right product for you. Aside from those features, this beach wagon is made with premium materials, so you’re guaranteed that it can withstand the sun and salt water. The handle and tires of this cart can also be folded and removed so that you can transport it with ease. Plus, you’ll get an additional heavy-duty tote bag when you purchase this product. The best part is that you can also use this product for gardening, fishing, and building projects as well. The Radio Flyer Ultimate EZ Folding Wagon has a lot of uses. First, it can carry up to 150 pounds of your belongings, thanks to its solid frame. And besides transporting your things, you can also use this wagon to haul your kids. In fact, this product has two padded seats and seatbelts where your kids can sit as you haul them from one place to another. Lastly, you can also turn this wagon into a bench after you’ve unloaded all your belongings. We think you’ll agree that it’s quite versatile! But aside from being a multipurpose product, this wagon is easy to store due to its collapsible design. It also has an adjustable telescoping handle for easy maneuvering. Plus, there are cup holders in the loading box for your drinks. What Features To Look For in a Beach Wagon? One of the most important aspects you need to consider in a beach wagon or cart is the total weight it can haul. So, choosing a product made with durable fabric and a strong frame is essential. Knowing the weight capacity of the wagon will also give you an idea of how many items it can transport. If you typically bring a lot of things to the beach, choosing a product with a high weight capacity is beneficial. Picking a product with pockets and compartments is also a plus so that you can keep your belongings organized. Aside from capacity, you also need to check the wheels of the cart or wagon. Remember, not all types of wheels can roll easily through sand. Wheels that are best for sandy beaches are large wheels or those with extra tread that can navigate through different kinds of terrain. The product’s durability is another factor you need to consider. Keep in mind that your wagon will be exposed to the sun and salt water for a certain period. Thus, high-quality wagons have frames that are typically made with aluminum or powder-coated steel to prevent rusting. Of course, the product’s portability is also vital. So, you also need to pick a lightweight wagon that you can easily fold up when you’re in the car or otherwise not using it. Added features, such as an umbrella holder and insulated food bag, are also a plus.